Welcome back to #ElevenSeasonsAndAMovie where I go through every Simpsons episode through season 11 and comment, opine, and reflect on it. 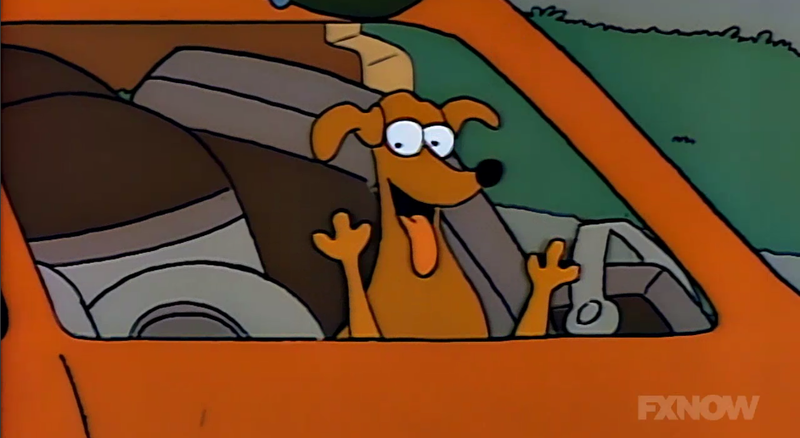 The Simpsons was a big part of my life and it, along with a few other shows, molded my humor that you all enjoy today. We return today with "Dancin' Homer." Homer is in Moe's Tavern regaling the regulars on his return to Springfield after leaving town to become a big-shot mascot for the baseball team the Capital City Capitals. 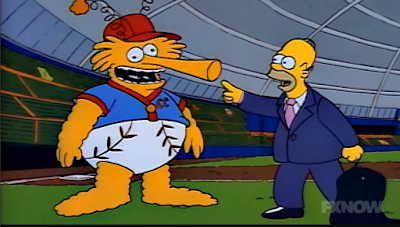 The story begins at an employee night at a Springfield Isotopes game where a drunk Homer, in order to get the fans up and cheering, begins dancing to Henry Mancini's "Baby Elephant Walk." It works and the Isotopes win a game. Homer is promptly hired by management and the 'Topes go onto a winning streak. Homer is then asked to join the Capital City Capitals. The Simpsons are hypnotized by the bright lights of Capital City but Homer's dancing antics do not thrill the big city audience and Homer is immediately fired while still in his underwear. The Simpsons return to Springfield and go back to their normal lives. Meanwhile, the bar flys love hearing Homer's story and ask him to tell it again. This was once one of my favorite episodes and in my top five from this season. But on this rewatch, I felt that it did not hold up as well. It may be due to it being more of a kid-friendly episode, which were still pretty common in the second season. There is no B-plot but the episode packs a lot of action into it creating almost an epic episode--a rise and fall. While I feel this episode wasn't as good as I remembered it, it is a well-written, well-scripted, and tight episode that few shows could hold a candle to. "Springfield Nuclear Plant Employee, Spouse, and No More Than Three Children Night"
The stadium sells 72 ounce tubs of beer. Ladies and gentlemen, the Gammills. Burns' card needs updating. It reads "Bart, Lisa, and Expecting." Burns throws out the first pitch and it lands only a few inches from him. Bart: "Hey, Burns! You throw like my sister!" Lisa: "Yeah! You throw like me!" 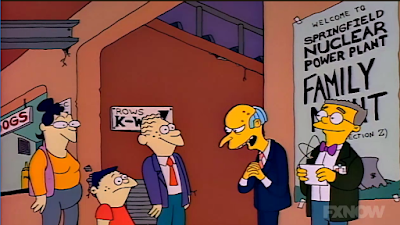 Smithers: "I think I could actually hear the air being torn, sir." 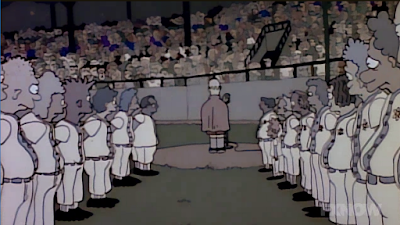 Bleeding Gums Murphy performs the "Star-Spangled Banner" and it lasts for 26 minutes. Only Lisa is left smiling at the end of it. Isotopes Announcer: "Oh my God! The Isotopes win a game!" 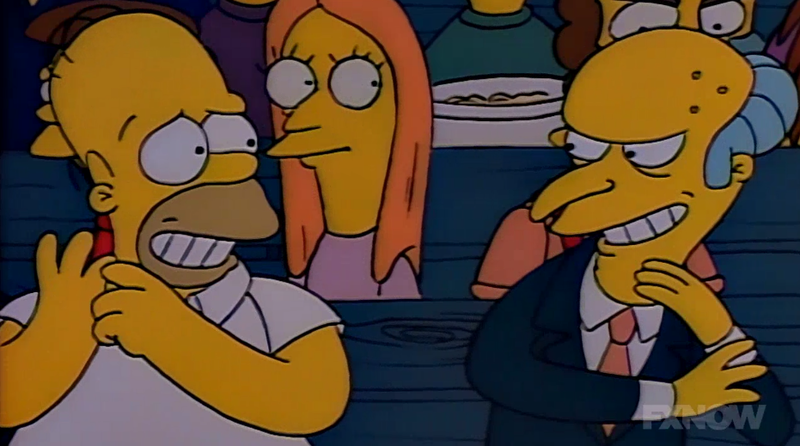 Homer: "They weren't laughing at me. They were laughing toward me." Shelbyville's minor league team are the ShelbyVillains. I never noticed before but when Homer spells out Springfield he spells it S-P-R-I-N-G-F-E-E-L-D.
Lisa, on why they shouldn't leave Springfield: "Everyone here knows us and has forgiven us." 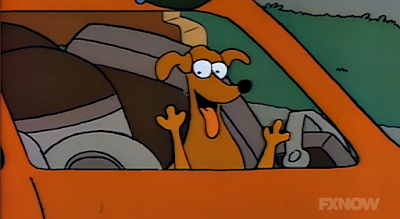 I love this piece of animation when the Simpsons are about to leave Springfield. Homer's boss allows to Homer to take a leave of absence for "4 years? 5 years!" 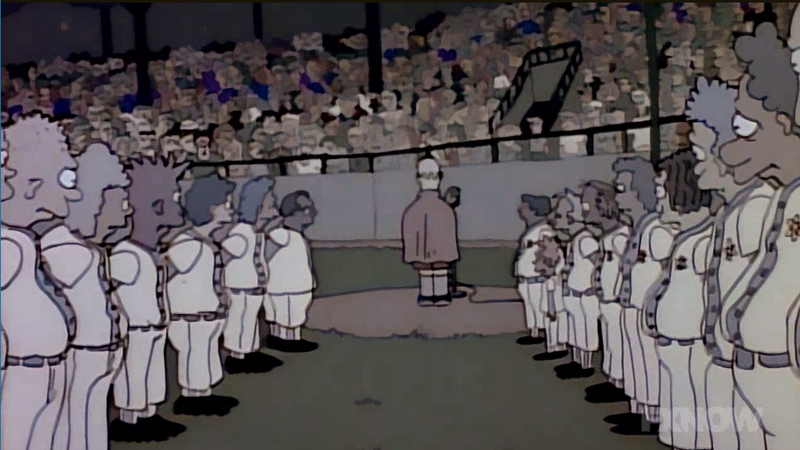 Homer's good-bye to the Isotopes is modeled after Lou Gehrig's farewell speech. Let's just say the gravity of this situation does not equal the gravity and emotion of Gehrig's farewell. And that's why the writing and animation is amazing. 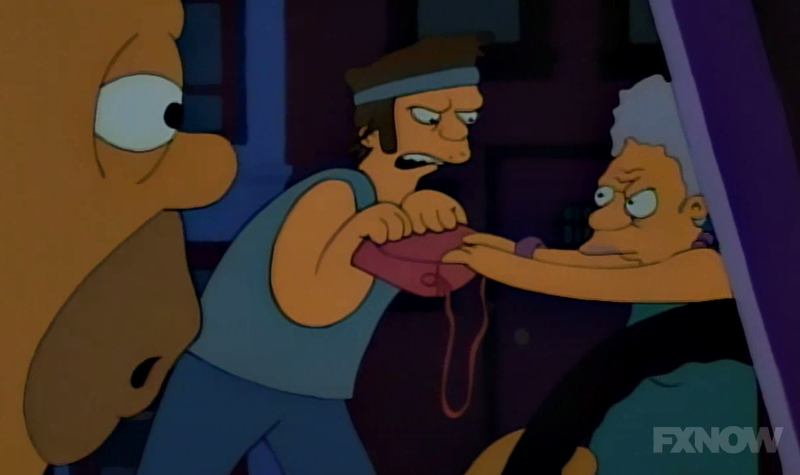 Homer, upon arriving in Capital City: "Look, kids, street crime." The Capital City song sung by Tony Bennett is one of the best things in this season. Trying to make all the things that every middle-sized metropolis has seem amazing and worth going to is hilarious. Two of the major attractions in Capital City are the Crosstown Bridge and the corner of 4th Street and D Street. I find it interesting that the Capital City baseball stadium has a dome. Currently, only 6 of the 30 Major League stadiums have a dome. Since Capital City is a minor league team, it might be because it's not just a baseball field but some sort of sports center where numerous sports are played. The people of Capital City don't like Homer's dancing antics but yet their mascot is the Capital City Goofball.